Over the last 20 years, noninvasive ventilation (NIV) strategies have been used with increasing frequency. 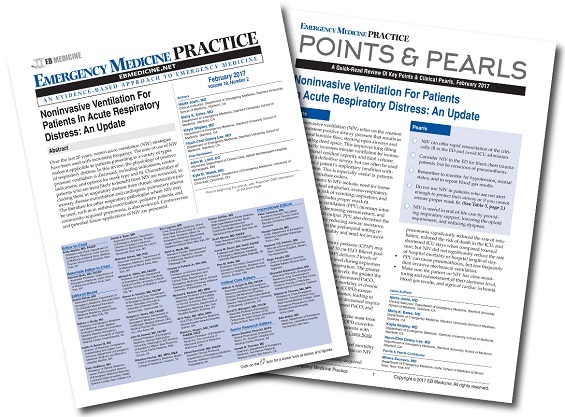 The ease of use of NIV makes it applicable to patients presenting in a variety of types of respiratory distress. In this review, the physiology of positive pressure ventilation is discussed, including indications, contraindications, and options for mask type and fit. Characteristics of patients who are most likely to benefit from NIV are reviewed, including those in respiratory distress from chronic obstructive pulmonary disease exacerbation and cardiogenic pulmonary edema. 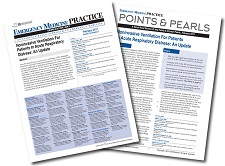 The literature for other respiratory pathologies where NIV may be used, such as in asthma exacerbation, pediatric patients, and community-acquired pneumonia, is also reviewed. Controversies and potential future applications of NIV are presented. This was an excellent article. Just the right length. I will now consider different types of ventilation masks for NIV.